WHAT: Brooklyn Botanic Garden’s GreenBridge community environmental horticulture program announces the winners of the 15th annual Greenest Block in Brooklyn Contest. 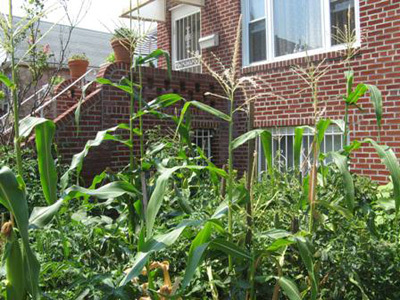 This year more than 250 blocks—the most ever—participated in the borough-wide greening effort. Contest winners were selected through a rigorous process by an expert panel of judges that included professional horticulturists from Brooklyn Botanic Garden, metro area horticulture professionals, gardening journalists, and other New York City greening organizations. First Prize is a $300 check for each top residential and commercial block winner. All other finalists will receive cash prizes ranging from $100–$200. Best Community Garden Streetscape, Best Window Box, Greenest Storefront, and Best Street Tree Beds winners will receive cash prizes or gardening tools, and all participants will be awarded a recognition certificate. WHERE: The press conference will be held at the winning block—stay tuned for notification on Tuesday, August 4, 2009. For more information and to schedule interviews, contact the BBG Communications Department at 718-623-7241.
WHO: BBG enthusiasts, supporters, and visitors from throughout the city are expected to attend the event. Remarks will be made by Scot Medbury, President of Brooklyn Botanic Garden; Marilyn Gelber, Executive Director of Independence Community Foundation; and Brooklyn Borough President Marty Markowitz. The Greenest Block in Brooklyn Contest is coordinated in cooperation with Borough President Marty Markowitz and sponsored by the Independence Community Foundation. GreenBridge is committed to helping improve the urban landscape through neighborhood gardening programs, classes, workshops, and events. Working with block associations, community gardens, businesses, and social service organizations, GreenBridge extends Brooklyn Botanic Garden’s resources to help connect people with plants and engage Brooklyn communities and residents in a unified greening effort. Founded in 1910, Brooklyn Botanic Garden (BBG) is an independent nonprofit institution committed to education, research, and the display of horticulture. BBG serves communities in New York City and internationally through its world-class gardens, extensive research collections, and numerous educational and community programs. Situated on 52 acres in the heart of Brooklyn, the Garden is home to over 12,000 types of plants and hosts more than 725,000 visitors annually. Brooklyn Botanic Garden was rated Brooklyn’s number one tourist attraction in Zagat’s 2008 Best of Brooklyn. Brooklyn Botanic Garden is open from 8 a.m. to 6 p.m. Tuesday through Friday, and from 10 a.m. to 6 p.m. on Saturday, Sunday, and holidays. The Garden is closed on Mondays; open holiday Mondays, except Labor Day. Admission is $8 for adults and $4 for senior citizens (65 and older) and students with ID. Children under 12, all school groups, and Garden members are admitted free at all times. Seniors are admitted free all day Friday, and the Garden is free to the public all day on Tuesdays and until noon on Saturdays (except Saturdays of major Public Programs such as Sakura Matsuri). Visitor entrances are at Flatbush Avenue, at the parking lot gate at 900 Washington Avenue, and at Eastern Parkway. By subway, take the 2 or 3 train to Eastern Parkway or the B (weekdays) or Q train to Prospect Park, the 4 train to Franklin Avenue, or the Franklin shuttle to Botanic Garden. By bus, use the B16, B41, B43, B45, B48, or B71. Parking is available at 900 Washington Avenue for a fee. For more information call 718-623-7200. Additional information is also offered online at bbg.org.